marginalia: Third time's the charm! Not that the first and second were flops; they weren't. But it's the third time I've done it in our four years of discussing books, and I think I did fair enough for this particular discussion. Every month, my book club meets up to discuss a designated/chosen book from a particular genre. Discussions are done not only face-to-face, though: an online discussion thread is also set up for the benefit of those who are geographically unable to make it to the actual discussion. A volunteer discussion moderator (usually) facilitates both online and offline discussions, scouts for a suitable venue for the face-to-face (F2F) discussion, etc. We've been doing this for the fourth year running, and I've already volunteered to moderate two discussions in the past: The Historian by Elizabeth Kostova in 2012 (F2F11) and What We Talk About When We Talk About Love: Stories by Raymond Carver in 2014 (F2F26). 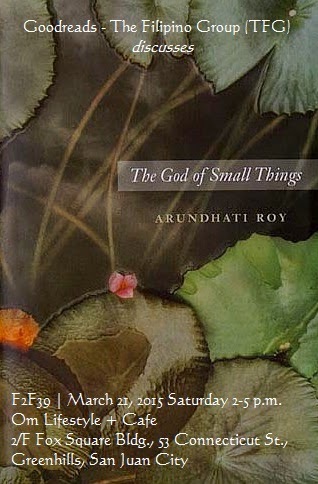 This year is my third time to volunteer, and we talked about The God of Small Things by Arundhati Roy (F2F39). 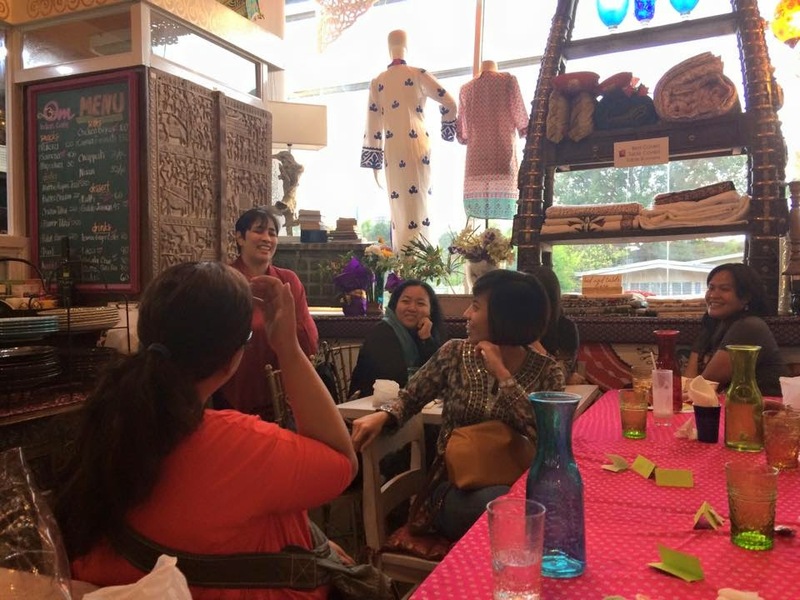 The discussion was held last March 21, 2015 at the Om Lifestyle + Cafe, a very charming Indian cafe and lifestyle store owned and operated by the mother-daughter team of Suman and Anjie Gogna in Greenhills, San Juan City. The genre for The God of Small Things is literary fiction, and the other nominated books are The Virgin Suicides by Jeffrey Eugenides (moderator's choice) and A Visit From The Goon Squad by Jennifer Egan. 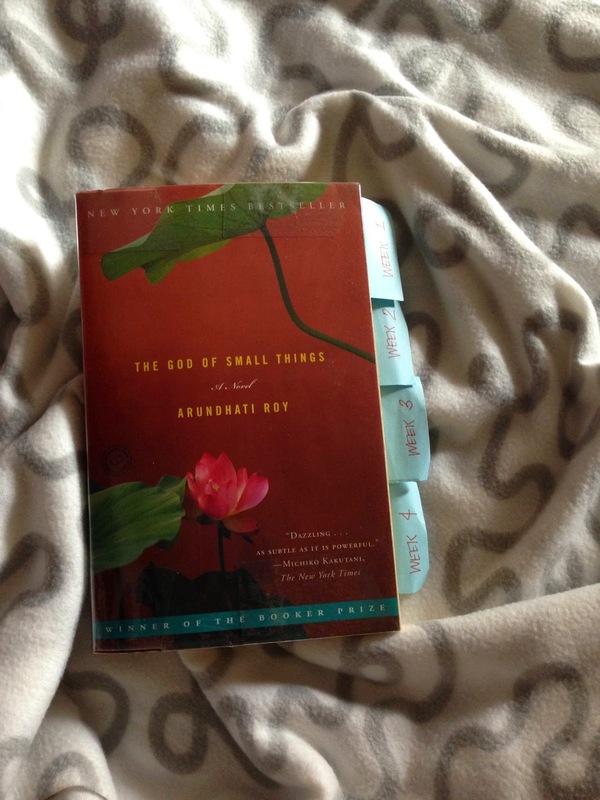 My initial take on The God of Small Things was mediocre, and I thought that perhaps I should give it another try. So I put it out there for the members to consider; I’m glad they voted for this, otherwise I wouldn’t have the chance to reread it and appreciate it for its real value. For the discussion portion, I prepared 20 questions. I asked people to draw one question each from a box, and the discussion took off from there. The God of Small Things is very rich in themes and plot, so I knew we were in for a meaty, substantial talk, and I wasn’t disappointed. After that, I made some announcements and gave out prizes (Online Discussion MVPs: Ingrid, Mawi and Aaron [3-way tie]; Online Activities MVPs: Aaron, Benny and Meliza [3-way tie again]; F2F MVPs: Kristel and Marie; Best Flash Fiction: Don't Cry Daddy by Aaron and Meliza; Best Family Tree: Araza Family Tree [Elaine]; and Best Alternative Title for TGoST: The House of History by Benny), and then I held a little game I call “As Many As You Can!” where two teams are required to list down as many items as they can think of in a particular category, which I was going to pick (e.g. books about or set in India). After a short break, we sat down again and shared our little stories about how Things Can Change In A Day for us (most of the stories were career-oriented). After that, it was a wrap. One thing I’m proud of about this particular discussion is the gem of a venue that I found. (Thank you, Zomato!) Everything about it is authentic Indian – from the food, to the decorations, to the dry goods for sale, the home decorations, the stationery – even the owners are Indian! 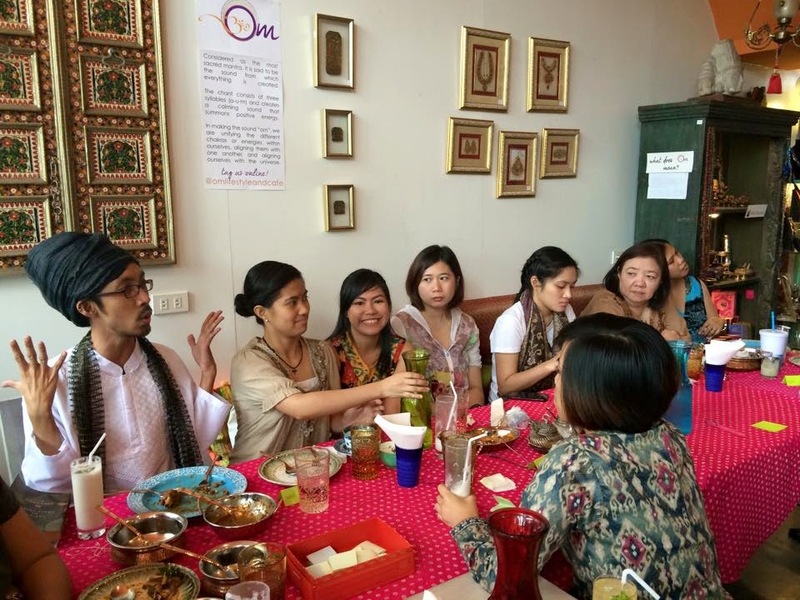 :D So we all had a good time talking about The God of Small Things in a truly Indian setting, with lovely Indian food (I had samosa, paneer tikka, gulab jamun, and lassi) and oh, we also came in our Indian-inspired outfits! Which reminds me, I also picked one person to win the Best in Indian Outfit award, and my friend Angus ran away with it, hands down. Counter clockwise, from top right: tasseled bookmarks for everyone; custom throw pillows for Online MVPs; small tote bags for everyone, and large and drawstring tote bags for MVPs; authentic bookmarks from India (specially handcarried from Delhi!) for the members of the winning team in the As Many As You Can! game; and custom wire "TGOST" bookmarks for select MVPS/winners. 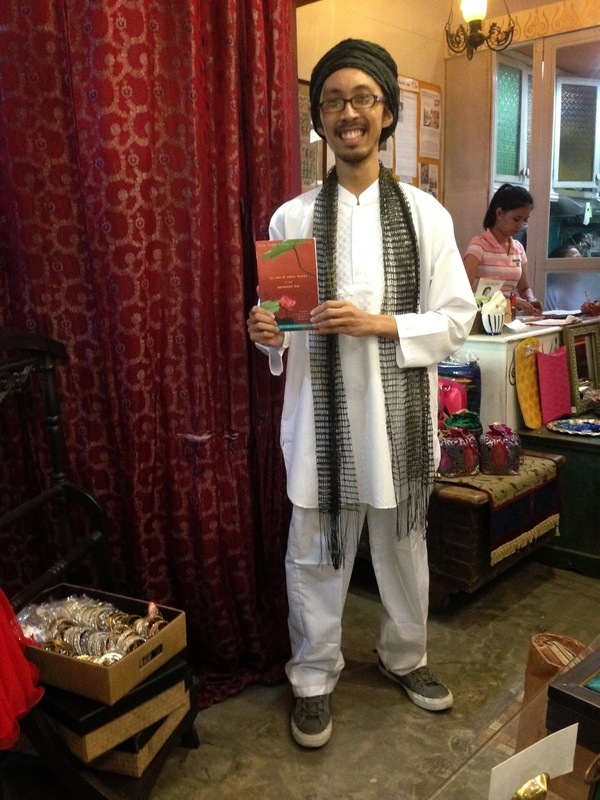 Not in photo: two authentic Indian bookmarks from Mrs. Gogna, which I gave to the F2F MVPs. I'm so glad you made a post about this. It kind of made me feel as if I went there myself. Sorry I couldn't make it! Everyone looks fantastic. Congrats for such a successful F2F again :D <3 miss you! Like Alexa, I'm happy you posted details about last month's f2f. Congratulations, Monique! I know all of you really had a great time.